Being something of a naturalist some of my most memorable trips have involved seeing birds such as the endangered resplendent quetzal in Costa Rica or the beautiful rose-coloured grosbeak in Alberta. So we wanted to find the facts behind the claims you often hear about just how bad wind farms are for birds and wildlife in general.This took us down a rabbit hole of research and browser tabs that landed us in the workshop of John Bowman. 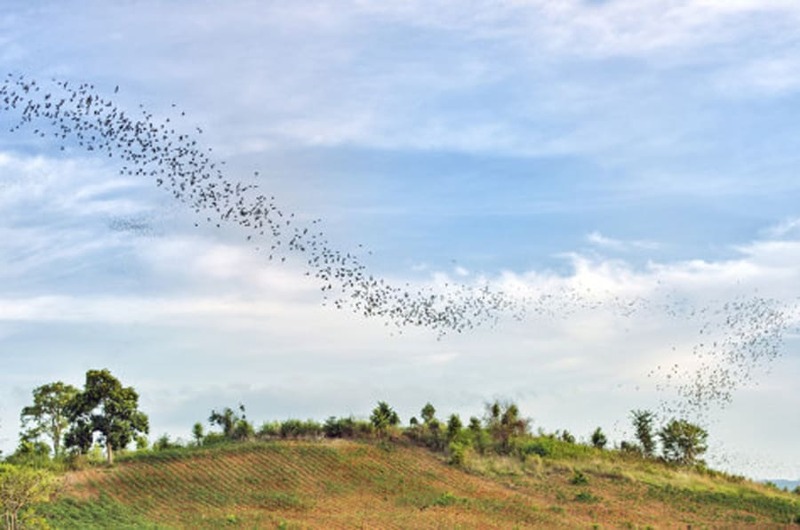 This is a horizontal, color photograph of the bat migration over the scenic landscape in Khao Yai National Park located in Nakhon Ratchasima, Thailand. Being something of a naturalist some of my most memorable trips have involved seeing birds such as the endangered resplendent quetzal in Costa Rica or the beautiful rose-coloured grosbeak in Alberta. So we wanted to find the facts behind the claims you often hear about just how bad wind farms are for birds and wildlife in general. This took us down a rabbit hole of research and browser tabs that landed us in the workshop of John Bowman. He's a university professor of mathematics who lives in Edmonton, Alberta. Thanks to a school science project Bowman and his son wound up developing a very cool wildlife observation tool -- the Batseeker. It can hear the echolocation clicks that bats make and it turns them into sounds that humans can hear. It isn't until you fire up one of these devices after dusk on a summer's night that you realize just how many bats are out there -- even in places like Edmonton or Calgary. Robert Barclay is a biology professor at the University of Calgary who has studied bats his entire professional career and he's a fan of devices like the Batseeker. "You don't see them but, as soon as you turn the microphone on, you can hear them clicking away their echolocation calls. And it brings home that there are lots of them around even in urban areas. And they are doing their part for the ecosystems that they're in. Because otherwise, birds are easy to see, big mammals are easy to see, but bats are somewhat invisible," says Barclay. 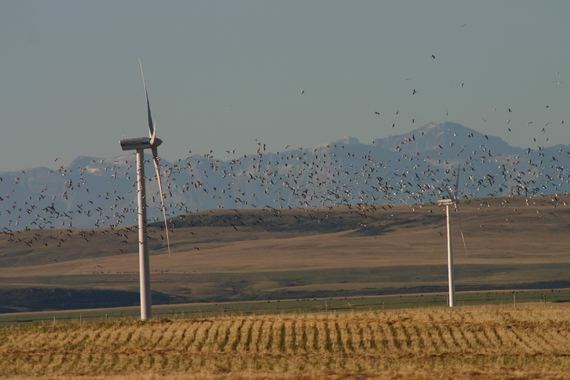 According to Barclay's research in southern Alberta migrating bats are much more likely than birds to be killed by wind turbines. Barclay and his students were hired to study the effects of wind energy on bats by wind energy companies after discovering their bodies under the turbines. Their findings on why wind turbines and bats don't mix pointed to two things: The wind turbine blades move too fast for the bats echolocation to help them and the low pressure area created behind the tips of the blades damages the bats lungs and vascular systems. It was Barclay's recommendations that led to mitigation efforts. By turning off the turbines when the winds were low during the bats migratory period in the late summer and early fall they reduced the mortality rate by 50 per cent. "And when TransAlta looked at the change in revenue, it was, in their eyes, relatively minor. So they've adopted that operational mitigation, as we call it, a change in how they operate their turbines to their fleet across the country. And, they're one of the biggest wind energy operators in Canada," says Barclay. These mitigation techniques are not ubiquitous across the wind industry but there are groups like the Bats and Wind Energy Cooperative working on this issue. Wind turbines can be hard on migrating bats and more study needs to be done to understand bat populations and behavior and how to reduce mortality. A 2013 study led by Environment Canada and published in the Aviation Conservation and Ecology Journal found that in Canada there were 270 million bird deaths a year from human activity -- of that number 23,300 were caused by wind turbines. When you do the math it means that 0.009 per cent of all bird deaths caused by humans in Canada were a result of wind turbines. Domestic house cats kill 200 million bird deaths a year. Your adorable little kitty is actually a bird-killing machine. And when you combine house cats with deaths from hitting power lines, tall buildings and vehicles you get the cause for 95 per cent of all human related bird deaths in Canada. But birds matter and wind industry representatives like Tyler Janz, the lead regulatory guy at Blu Earth Renewables, employ a number of strategies to reduce bird impacts when developing wind projects. "Keeping turbines off of ridge tops, upwind of side slopes, away from pronounced valleys, obviously, it's to minimize raptor fatalities in that they use the wind currents created by those features to fly and hunt," says Janz. Keeping wind turbines off the migratory routes of birds and bats is another effective mitigation tactic. And on the operations side there are periodic shutdowns or deliberate slowing during specific times of the year when they know birds are in the air. But it's all a balance. Despite what turbines do to bats Barclay still calls himself a fan of wind and renewable energy. "I like to tell my conservation biology class, it doesn't matter how we get our energy, there are environmental impacts. What our goal has to be is two-pronged -- reduce our energy consumption and find ways to mitigate or reduce the environmental impacts of however we get our energy," says Barclay. And if scientists like Barclay can help us reduce the impacts on wildlife wind power can help us fend off one of the greatest threat of all to birds, climate change. A report compiled by the WWF found that bird extinction rates could be as high as 38 per cent in Europe and 72 per cent in north-eastern Australia, if global warming exceeds 2 º C. Wind energy is not a climate change panacea but it can dramatically reduce carbon emissions an important step in combatting climate change.